Does anyone know what period this is from? And what the decoration means. wanted to throw it away, because of the damage. We can't help you with pricing. Basically, what I do is keep items I am not sure about and look at them again a year or so later, while I keep learning more. Start reading about age signs, etc. to learn, but also get relevant books, and look at lots of items, genuine and fake. That gives you the real experience. This item is export porcelain. Age signs must be present, and from the color or blue tone, foot rim, decoration style, etc. it is possible to tell or guess from about what period it "could" be. 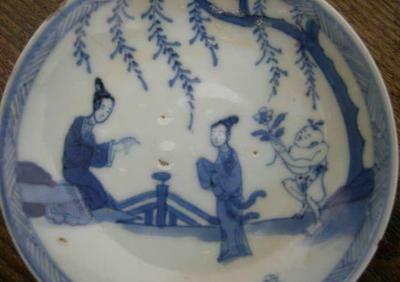 In this case, the blue tone and shape of the foot seem to indicate it is 18th century, but the decoration could also be 19th century. Faces, eyes, hairdo and clothes can be used for judging the period something was made in. Hi peter, I have a question I want to ask you. about the blue and white plate, I placed on this site! How can you know the period of this item, while there is no mark? (this because I want to learn for myself) can you give me a more specific date? for example 19th or mid 19th century? Other question is, someone is interested in it and wants to buy it. But I don't know what this beautiful little plate is worth? Can you help me please? 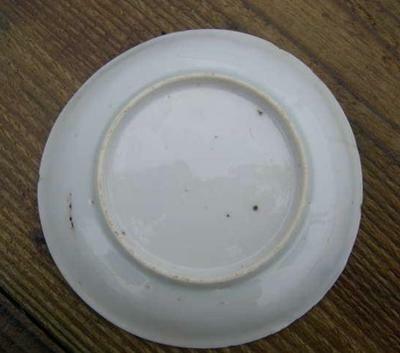 Below is the reaction you wrote about the plate. Again I am very pleased by your site, I love it. And I really appreaciate all the help you give!! 'One man's trash is another man's treasure' or so goes the saying. 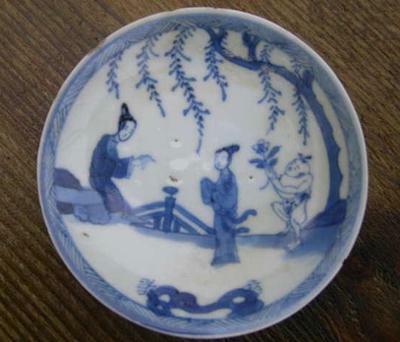 This is a Qing dynasty plate. This plate is in much better condition than many I have seen. Rim chips and the like are normal for antiques. Some people have them restored, some don't. Two women and a boy in the garden. A very attractive plate.